OPPOSITION POLITICIANS HAVE accused the government of introducing “a landlords’ Budget”, after it announced tax breaks for landlords in today’s Budget statement. Finance Minister Paschal Donohoe confirmed that landlords would be entitled to relief of up to 100% of the interest paid on loans for the purchase or refurbishment of residential property. 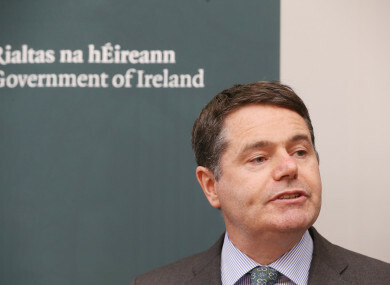 This measure was scheduled to be introduced by 2021 but Donohoe said that he was bringing it forward to come into effect on 1 January 2019. Housing Minister Eoghan Murphy said that the measure would “incentivise landlords to remain as landlords”, but this was rejected by opposition parties. Sinn Féin’s Eoin Ó Broin TD described it as “an unnecessary tax relief to landlords” while Labour’s Alan Kelly TD questioned why landlords “can buy a house for cheaper than a family”. Solidarity TD Paul Murphy TD said it was evidence of “a landlords’ budget from a landlords’ government”. Landlords group the Irish Property Owners Association (IPOA) has “cautiously welcomed” today’s announcement. “Like every normal business, landlords have to cover costs and make it worthwhile to continue, ” said IPOA Chairman Stephen Faughnan. I hope this small start will represent a real decision to make it possible for landlords to continue playing a full part in providing quality and affordable accommodation to the 20% of the population living in rental properties. The Budget has also promised an extra €121 million for the Housing Assistance Payment (HAP), which supports people on local authority housing lists pay for rental accomodation. People availing of the HAP scheme can take up full-time employment and keep their housing support. The scheme is administered by the local authorities, who pay landlords directly. A critical exit mechanism for families and individuals in emergency accommodation or at risk of homelessness. But housing charity Threshold argued that the interest relief measure could be a disincentive for landlords to actually use HAP. Chief executive John-Mark McCafferty said that HAP “was an important scheme for supporting low-income households” and must be protected. “We are seriously concerned about the impact of the 100% tax relief to all landlords,” McCafferty said. By extending this relief, the minister may have disadvantaged tenants who rely on HAP, as the tax incentive to enter the scheme for landlords has been reduced by today’s move. Any new tax reliefs for landlords when introduced must be explicitly linked to high standards in the provision of rental accommodation. Concern has also been raised that the interest relief for landlords could mean more tenants are forced to leave their homes due to refurbishment by landlords. Caroline Fahey of the Society of St. Vincent de Paul said it could leave tenants vulnerable. After Budget 2019, tenants on low incomes in receipt of HAP or rent supplement will continue to pay unsustainable top ups to their landlords just to keep a roof over their heads and will remain vulnerable to homelessness in the event of a rent increase or if the landlord wishes to sell or refurbish the property, or let it to a family member. Email “Government accused of 'a landlords' Budget' over tax break for landlords”. Feedback on “Government accused of 'a landlords' Budget' over tax break for landlords”.